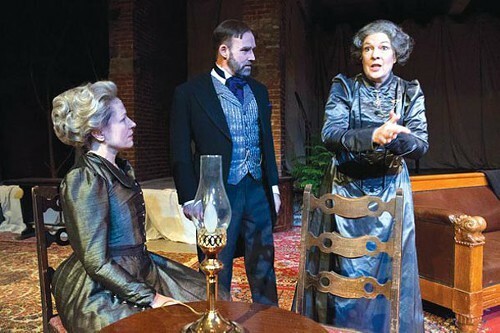 In promoting its new production of this 1896 play by Henrik Ibsen, about a disgraced businessman, Quantum Theatre is playing up parallels with modern bilkers like Bernie Madoff. Such echoes are real, but watching a performance last week I was more struck by resonances with rhetoric surrounding today’s natural-gas rush. While he was jailed for defrauding investors, for instance, and Ibsen doesn't dwell on details, Borkman doesn’t seem to have been running a Madoff-style Ponzi scheme as such. Rather, he perceives himself as a titan of extractive industry: His schemes revolved around mining ventures. From left to right: Robin Walsh, Malcolm Tulip and Bridget Connors. Borkman in fact justifies his behavior (“I acquitted myself”) by casting himself as a herald of civilization who alone heard the precious minerals lying beneath the mountains, crying to be released. In other words, in trying to convince everyone else he wasn’t just after the money, he’s convinced himself of the same thing. Hard not to think of drilling outfits who say they’re pursuing “energy independence” for America by using fracking to “free” natural gas from rock formations deep within the earth. 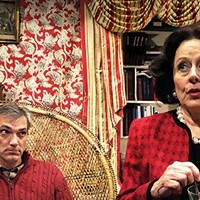 The play — here’s Michelle Pilecki’s review for CP — is a cerebral, darkly comic melodrama about the relationships between Borkman, his wife, his former lover — who's also his wife’s sister — and his son, a young man whom all three adults fight over but who has his own ideas about how to live. Director Martin Giles makes excellent use of the characteristically idiosyncratic space Quantum has chosen to stage the work. It’s a raw former industrial space on the first floor of East Liberty’s Hart Building, with a two-foot-high concrete platform running across backstage that stands in for the second-floor chambers where Borkman paces incessantly. Extra credit to scenic designer Tony Ferrieri and lighting designer C. Todd Brown for finding a clever way to transform a Victorian living room into a snowy Nordic landscape in just a few minutes of stage time. 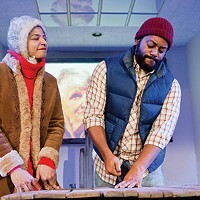 There are five more performances of John Gabriel Borkman today through Sunday, at 6022 Broad St.
Tickets are $18-48 and available at www.quantumtheatre.com.